The day before, Peter Kellner, president of YouGov, speculated that the SNP could end up winning as many as 20 seats at the election, “mainly at Labour’s expense”. A No vote in the Scottish referendum and a rampant, re-energised SNP was not a combination many were talking about a month or so ago. They’re certainly talking about it now. Kellner concedes his figure of 20 seats is not a prediction, more speculation. I admit I have previously ruled out the SNP making any gains off Labour whatsoever. I’m still minded to think the party is more likely to seize seats off the Liberal Democrats – Gordon in particular – but maybe it’s time to reconsider. Look at the size of those majorities. I find it very hard to believe most of these can be overturned by the SNP – at least, not in one go. 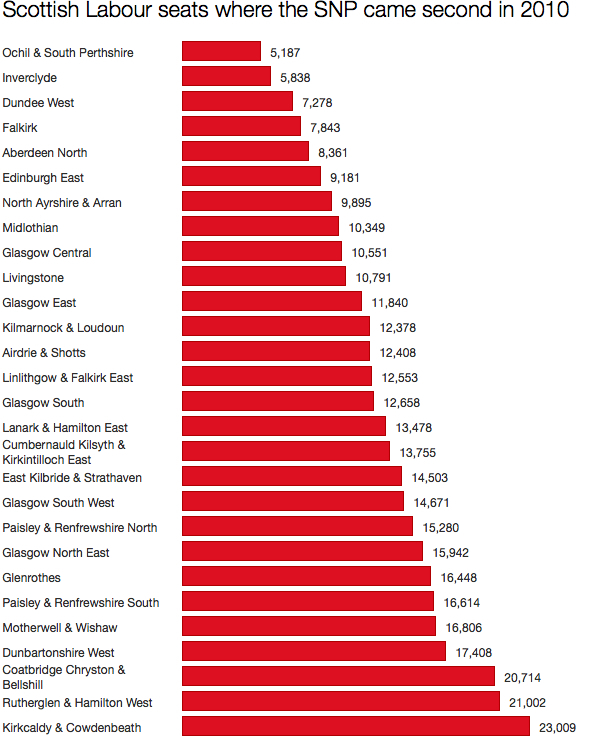 Glasgow was one of the few parts of Scotland to vote in favour of independence, so it’s not unreasonable to consider the likes of Glasgow Central, Glasgow East and Glasgow South as marginals rather than safe Labour seats. All three have hefty majorities, however. Far more plausible targets are those at the top of the list, up to and including Falkirk. The SNP’s Annabelle Ewing came very close to winning Ochil & South Perthshire in 2005, reducing Gordon Banks’ majority to just 688. Banks fought back in 2010 and increased this to over 5,000, but it’s likely Annabelle (daughter of Winnie) will be back for a third attempt. She must stand a good chance of making it a close contest, though the seat lies wholly within the Clackmannanshire council area – famously the first No declaration on referendum night. Inverclyde was won by David Cairns for Labour in 2010 with a majority of 14,416, though this fell to 5,838 in 2011 the by-election triggered by Cairns’ death, a contest won by Iain McKenzie. In this seat and in Dundee West my instinct is the swing needed for the SNP to triumph is a touch too big to achieve in one haul. Falkirk, with its recent rather undignified political history, might be different. It’ll be fascinating to see the next opinion poll of Scottish voting intentions at the general election. This will give us a bit more of a steer as to whether any of the above seats may change hands. One thing is already clear, though. The Tories may be gleeful at the prospect of Labour losing MPs in Scotland, but they’d do well to remember that the party to whom they would be lost is not a) the Tories or b) a party that would ever be likely to prop up a Tory minority government, let alone a coalition.